The position is strategic as long as in the middle of a triangle between Florence, Siena and Arezzo; within short distance from Chianti wineries and Italian shopping centres with the best brands and much more. 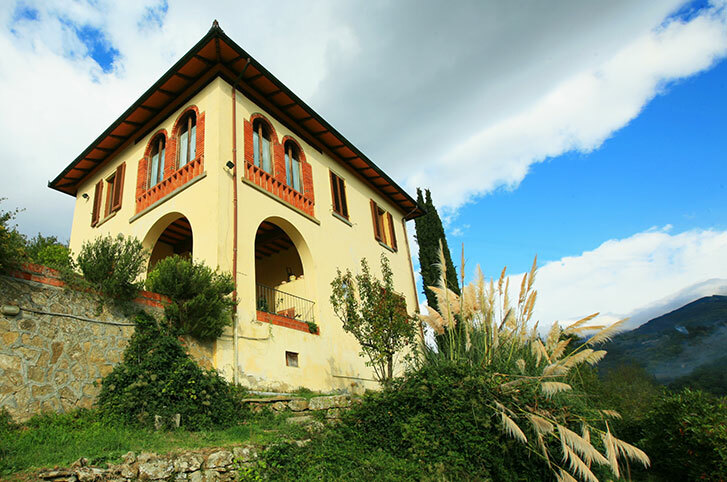 Charming Tuscan villa located inside a wonderful estate which produces top quality extra virgin olive oil. The house is set among olive groves, surrounded by the green countryside which composes the typical Tuscan landscape. The villa has a private garden which makes it a secluded and peaceful place, ideal for a full immersion in Tuscany's style of life. The owners who run the olive oil producing estate will be always available to help you, give you tips and even lead you to special places in the area. Besides, you can arrange directly with them an exclusive Tuscan dinner prepared in your villa with their own extra virgin olive oil, [a:274:Chianti wine] from the surrounding wineries and delicious fresh products. The garden is provided of complete garden furniture. There is a pizza oven and a barbecue structure behind the villa. 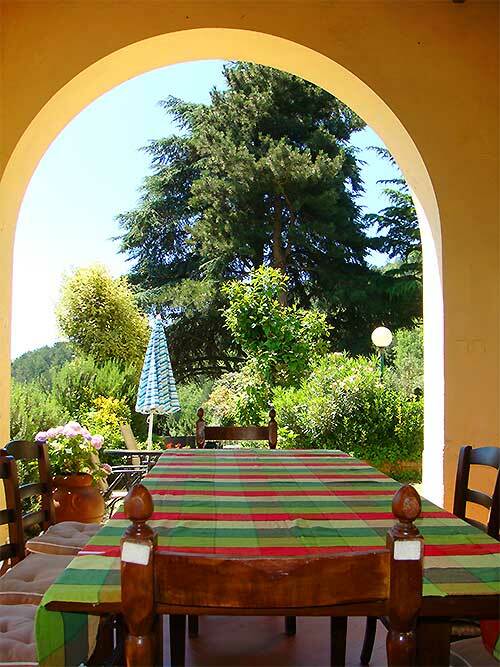 The wide loggia hosts a large wooden table and seats for 8 to 10 persons to have meals al fresco. 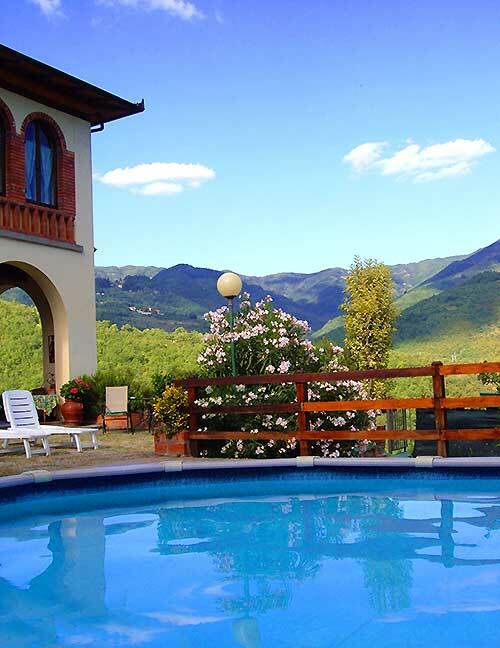 The villa is set on a slope, on the top of a hill and offers stunning views of the Tuscan mountains of Pratomagno, a hilly chain that connects the Chiana valley with the mountains of [a:359:Casentino National Park] and to the West side you have the Chianti hills. A lovely place set in the vicinities of the medieval village of Loro Ciuffenna, which can be reached by foot through a natural path (700 mt.). In front of the villa guests can enjoy a private swimming pool (10 x 5 mt.) with an equipped solarium for sunbathing in complete privacy. There are umbrellas, sun beds and reclining chairs available for everyone. 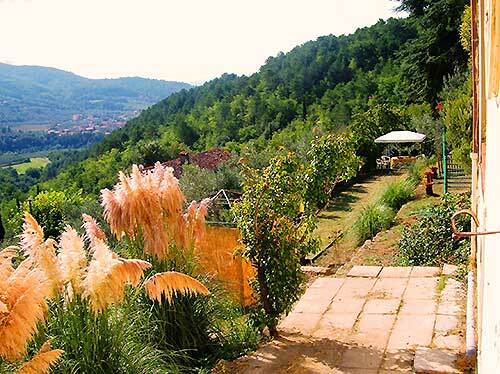 The garden extends downstairs, on the lower part of the slope, where you find a tennis table and an Italian bowling field for funny afternoons after a wonderful day trip or a mountain biking ride (bikes are available in the villa for free use of guests). 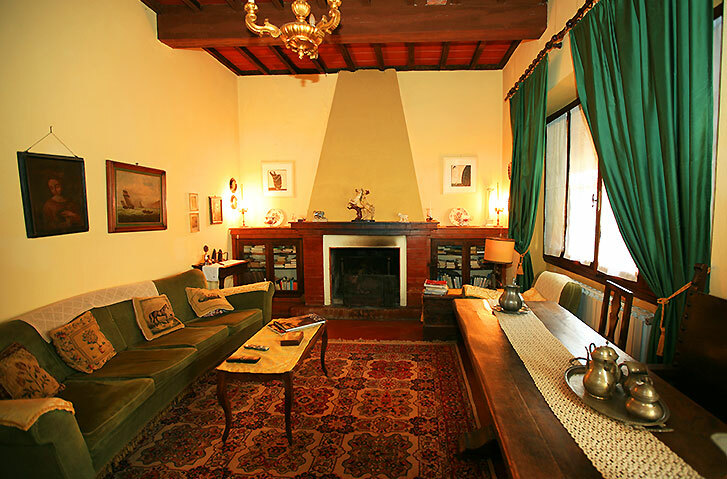 From the loggia you reach the main hall which leads to the cozy living room with open fireplace. 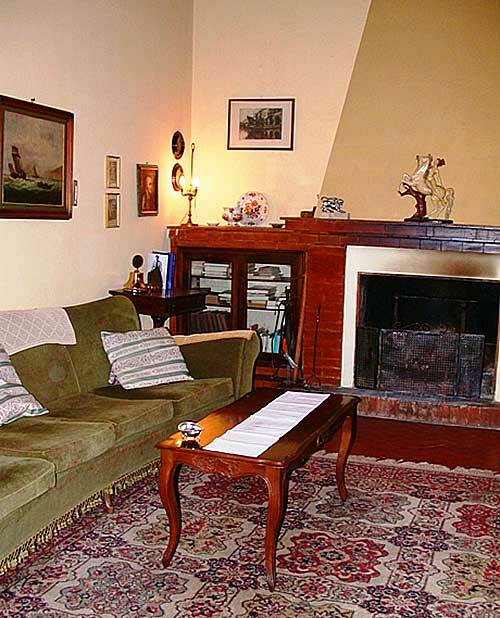 The living room is furnished with antique pieces, like the velvet divan and a massive wooden table, in addition to many family objects and books. A SAT-TV is available. 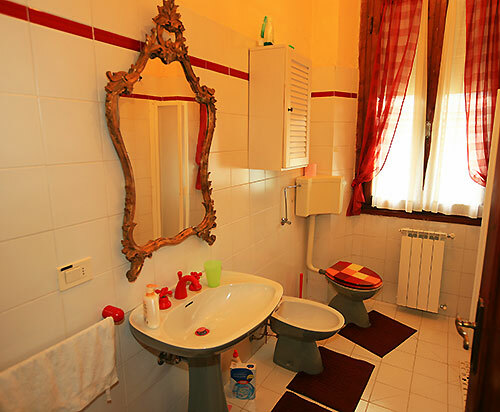 There is a fully equipped bathroom on the ground floor, with shower, WC, sink and bidet. On the ground floor of the villa is also located a wide eat-in kitchen furnished with a large table and seats for 8 persons. The kitchen is fully equipped with all necessary cookware, tableware, utensils and appliances: refrigerator with freezer, dishwasher, microwave, stove, oven, American coffee maker, stainless steel double sink. On the first floor there are four bedrooms and one bathroom. 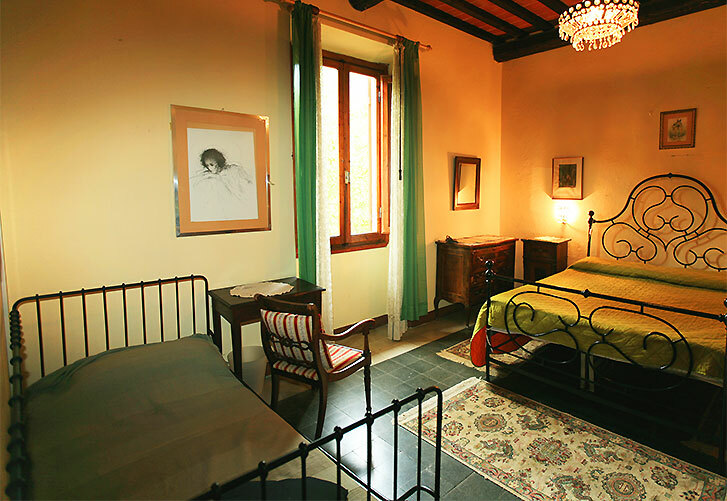 One bedroom is furnished with two wrought iron twin beds, in typical Tuscan style. 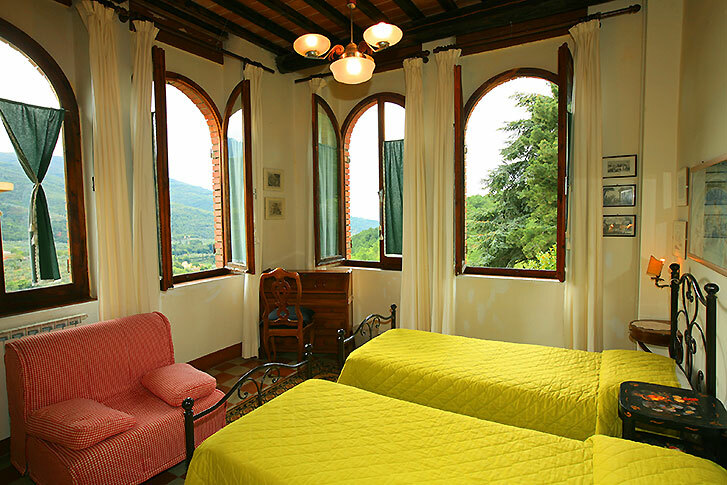 This bedroom has four large windows with stunning views of the surrounding green hills, the garden and the pool area. A single sofa bed can be added upon request for one extra person. 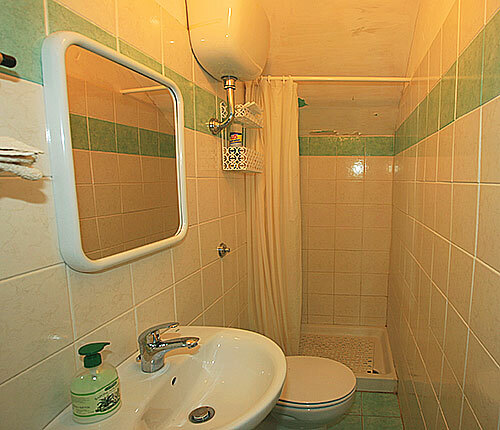 On the first floor there is one fully equipped bathroom, with shower, WC, sink and bidet. 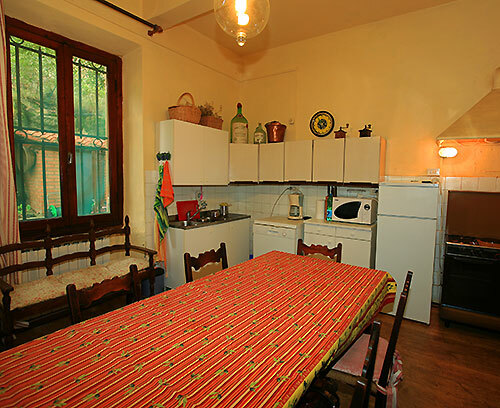 The villa is also provided of a washing machine, iron and iron board. 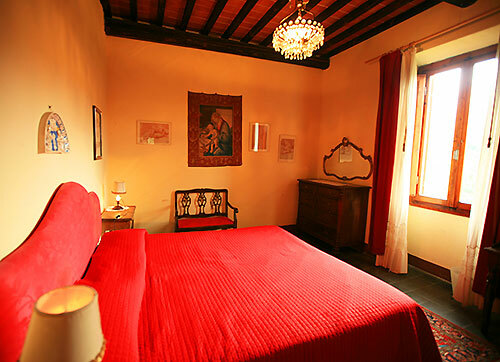 The second bedroom is a stunning double bedroom, with a tasteful furniture in typical Tuscan style, with rich fabrics, wooden dressers, antique pieces. Upon request the owner can provide a baby cot and highchair. 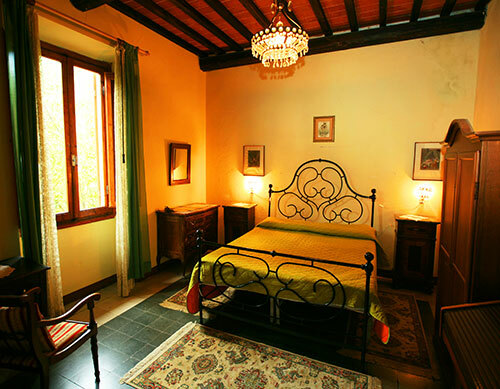 The third bedroom has a lovely wrought iron bed, which is a typical Tuscan handicraft, and tasteful decoration to make it very roomy. 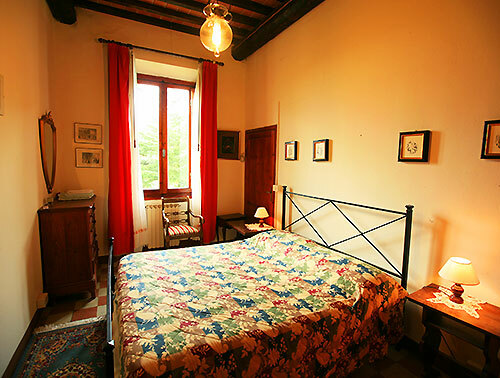 The last bedroom is furnished with a charming wrought iron double bed plus a single bed. 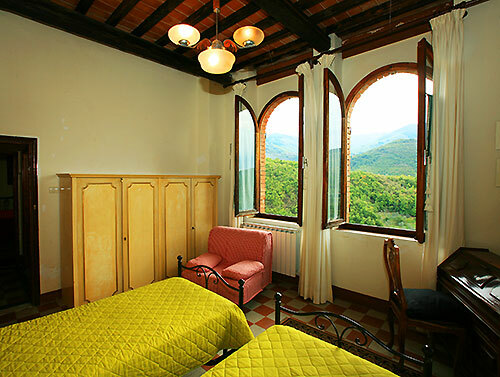 The decoration is rich of details of the Tuscan country style, with antiques, wooden wardrobe and family pieces. All rooms still preserves the original wooden ceilings and ceramic floors. Silence and piece are the main characteristics of this villa, where to relax and recharge your energies in contact with nature, where to live the everyday life of countryside yet with all comforts. 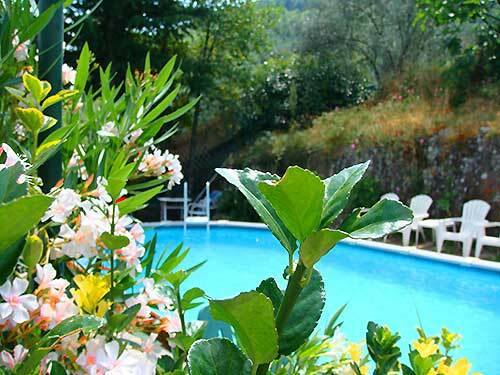 The flowery garden which surrounds the villa and the pool area reflects perfectly this peaceful atmosphere. You can make nice walks all around or ride a bike into the closest medieval town. Only 5 minutes walk from the villa there is a little river coming down from the mountains. 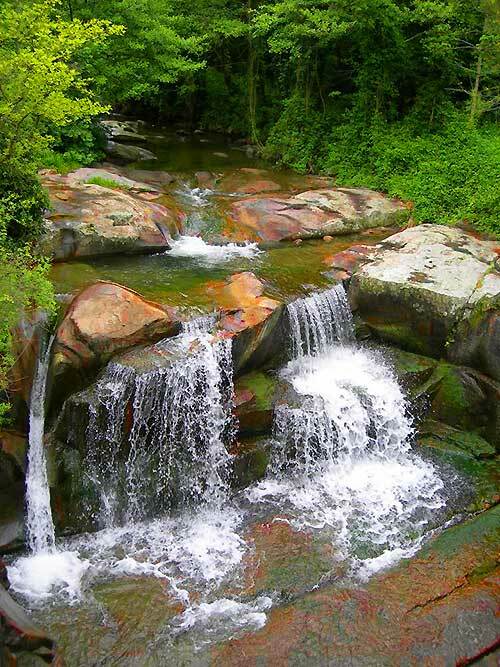 This stream with its crystal clear water and natural bathing spots is great with kids of all age. You can even try your luck with trout fishing. Within less than 1 hour drive you can reach three main cities: Florence, Arezzo and Siena, as well as the villa is located inside this triangle. In the vicinities there are many interesting attractions like small medieval villages, Romanesque churches, wineries and extra virgin olive oil producers. Besides, in the surroundings you can reach the best of Italian design and fashion industry: Prada's establishment with direct sale is 7 km away; [a:249:The Mall] – an outlet centre with all Italian brands like Gucci, Armani, Fendi, etc. - can be easily reached within 20 minutes drive and one of the most important gold producer is located nearby. A BBQ which is built with either a stone or brick base, cannot be moved. Approximate distance from the house to the closest local system of public transport (bus a/o train) which eventualy connects with a national system. We spent two wonderful weeks here at Villa Fabiola in beautiful Tuscany. 3 families and 3 generations from two different parts of the world. Here at Villa Fabiola grandfather has come from United States and for the first time met his 8 months old grandson from Russia. A great place for such a great occasion. We are really greatful to the owners for their warm welcome and care during our stay. They were happy to make our vacation pleasant and careless. Hope, we will be back soon! Moscow Russia and Minneapolois USA- 23 May 2014 Mr.Solovey Andrey 10/05 2014 al 24/05/2014. 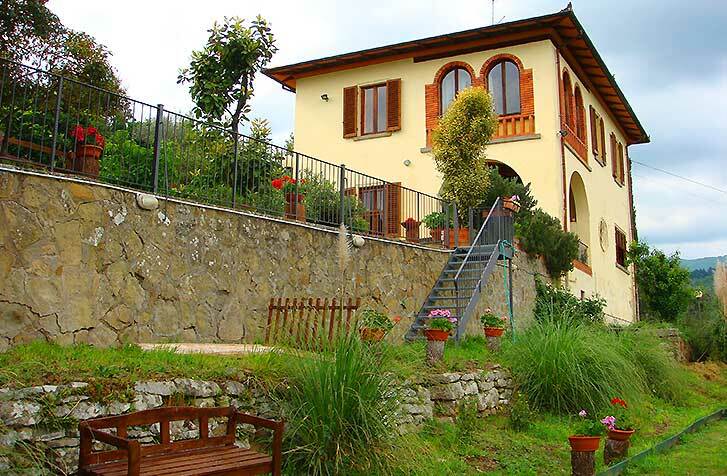 This is the third Tuscan villa, we have rented via Tuscan Villas, and Villa Fabiola (the right spelling is Fabbriola !) is definately the best of those for our Family. The house is perfect, and the owners are much more helpful and interested in the guests wellbeing, than we have ever experienced before. On your web, you can see, if a villa has a private pool. For us, the importent thing is that the pool is not directly visible from neighbourgs, roads etc. This villa is in total privacy, but it is not clear on the web, which of the villas have this kind of luxury. 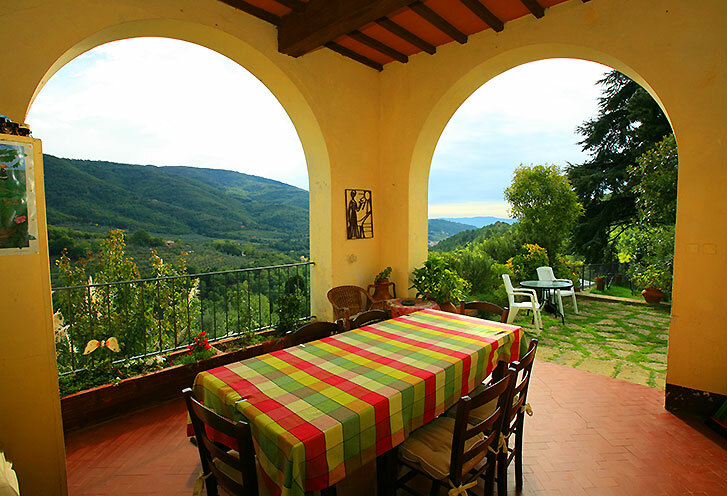 Villa Fabiola was a wonderful villa set away on a hillside overlooking the beautiful village of Ciuffena. Its owners, Luigi and Maria Pia, were very kind and gracious hosts. We brought back great photos, great memories, and wonderful new friendships.